Mushroom farming, if preplanned and properly executed, is a profitable venture you can start within the confines of your house. The key to success is to select the type of mushrooms adaptable to the climatic conditions of your area, provide proper conditions for optimal growth and development and ensure quick and reliable distribution that does not compromise on mushroom freshness to customers or retailers. Grow shiitake, morel, truffles and other varieties that chefs and consumers use for health benefits and flavoring. Develop a business plan highlighting important factors such as the types of mushrooms you want to grow, the target market, allocated budget, area of growth, transportation costs and any marketing costs. Research thoroughly about the types of mushrooms adaptable to the climate of your area. Create hardwood logs for growing mushrooms. Measure and cut logs 3 feet long and up to 6 inches wide. Immerse in a tub of water for up to 2 hours if the logs are dry. Drill 25 to 30 holes in each log that are 1 1/2 inches deep and 5/16 inches wide. Space the holes 4 to 5 inches apart. Inoculate the logs with mushroom spawns in late spring or early fall. Hammer a spawn plug into each hole until it reaches 1/4 inch below. Add cheese wax to a crock pot and place it over high heat on a stove until it melts. Drip melted wax into each hole with a turkey baster. Arrange the logs vertically in a shaded spot, and use a soaker hose frequently to water them and prevent any from going dry. Monitor the logs frequently for mushroom production. Mist the area with a soaker hose on nonrainy days to provide growing mushrooms a moist and humid environment. Never allow the logs to go dry or dehydrate. Wear gloves and harvest mushrooms individually when they are mature. Different mushrooms are graded for profit differently, so know when your mushrooms reach their highest grade. This enables you to harvest the mushrooms at the right time so they are neither immature nor too ripe. Collect in plastic trays. Unlike other vegetables, mushrooms require a moist and dark area packed with organic material. This can be a cupboard, shaded basement or garage or any area packed with mulch. Start with an easy-to-cultivate variety of mushrooms such as shiitake (Lentinus edodus) or oyster (Pleurotus species). Cut hardwood logs from honey locust, elm, oak, beech and maple trees in the dormant season. 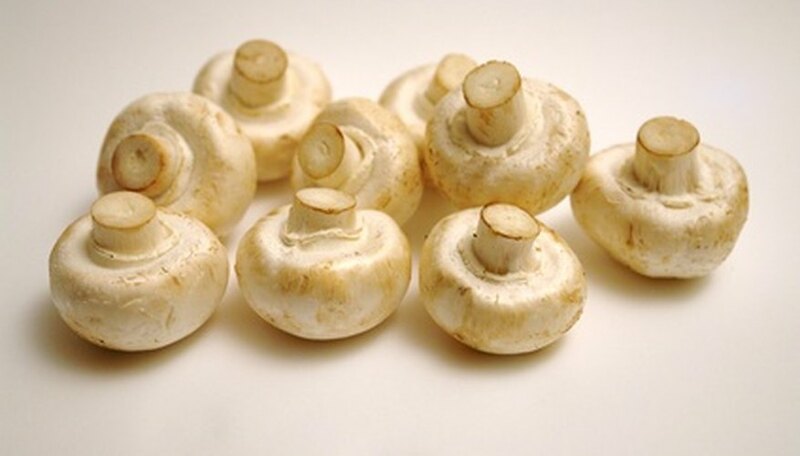 Purchase mushroom spawns from mushroom suppliers; you could instead inoculate pasteurized medium such as grain in a sterile mushroom-species culture, but that takes longer. Stimulate fruiting by soaking logs in water tanks. Harvest often to earn the best price for your mushrooms. Package delicate mushrooms carefully to minimize chances of damage during transportation. Stack them carefully in clean plastic containers. Sell mushrooms on-site, to restaurants, domestic consumers or at your local farmer's market.